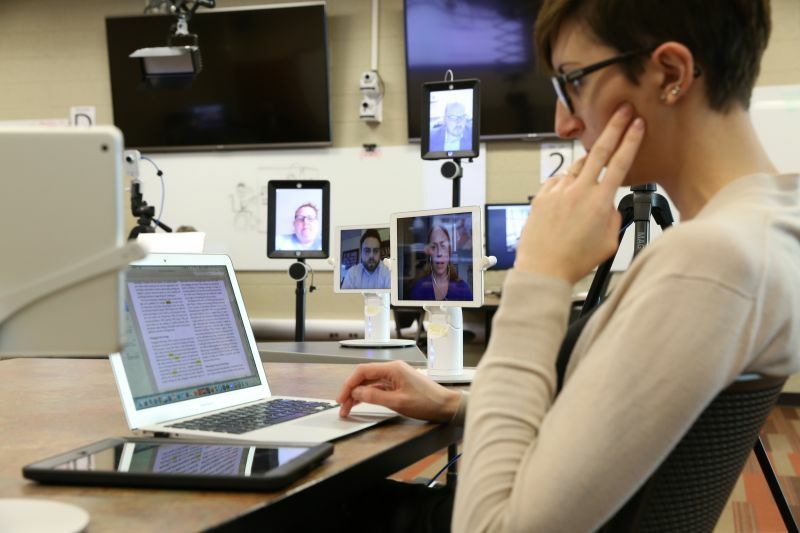 "At Michigan State, some online students embody robots to populate face-to-face classrooms, helping bridge the distance gap with their on-campus counterparts" notes Mark Lieberman, Digital Learning Reporter at Inside Higher Ed. A face-to-face student sits in a class session with her peers at a distance. Three years ago, Christine Greenhow, associate professor of educational psychology and educational technology at Michigan State University, attended a faculty meeting that would set her on an unexpected path. Presenters from the institution’s design studio showcased two different models of robots: a Kubi, which “looks sort of like an iPad on a neck that sits on a desk,” according to Greenhow, and a Double, which can roll around hallways. The designers said they were employing the robots at alumni meet-up events, allowing out-of-town participants to mingle with their on-campus former peers. But Greenhow envisioned another place for the robots: in her own classroom. Greenhow teaches doctoral courses with between 10 and 15 students -- some on campus, others participating synchronously online. For years, she struggled to bridge the “transactional distance” that remote students faced when trying to integrate into classroom discussions and activities. The robots, she thought, could solve that problem. Greenhow has been using robots in her classes ever since. She recently published in Online Learning a study detailing her first attempt -- in spring 2015 -- integrating the devices into her classroom, revealing that online students felt more engaged when participating through the robots than when they appeared in the classroom via Zoom or another videoconference platform. The institution has since scaled up its robot inventory, purchasing 14 robots and using 15 more on loan. To populate the robots, online students simply download free software on their personal computers and log in. They can remotely control their movements and zoom level using the arrow keys. Greenhow said she was nervous to get acquainted with the robots on her own -- but she had help from one of the institution’s “tech navigators,” who sat in on classroom sessions and performed on-the-spot troubleshooting. John Bell, professor of educational technology and director of the institution’s Counseling, Educational Psychology and Special Education/College of Education Design Studio, oversees those tech navigators. His team purchased two robots for Michigan State on a whim after a previous project came in under budget. Early responses from students used words like “transformative,” convincing Bell that they merited further exploration.